A visitor walks by an installation by Haitian artist Jean Ulrick Desert, titled "The Burqa Project-On The Borders of My Dreams I Encountered My Double's Ghost" for an exhibition "Islam, It's Also Our History" at the Espace Vanderborght in Brussels, Sept. 19, 2017. BRUSSELS — For months after the Brussels extremist attacks of 2016, it seemed an exhibition on Islam's legacy in Europe might never open in the city. At first, the creators and city officials felt the time wasn't right, and then they struggled to find a location willing to host a show certain to be seen as controversial by some. But the "Islam, It's Also Our History" exhibition at the city-owned Vanderborght Building finally managed to open last week and is telling its story of a long Islamic presence on European soil that has shaped Western culture in areas ranging from medicine, philosophy and architecture to diplomacy, language and food. 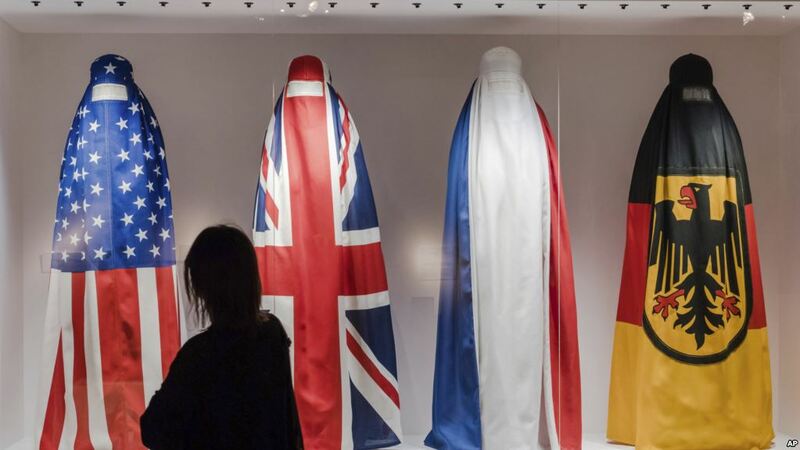 "We want to make clear to Europeans that Islam is part of European civilization and that it isn't a recent import but has roots going back 13 centuries," said Isabelle Benoit, a historian with Tempora, the organization that designed the exhibition. Funded by the European Union and Belgian authorities, the show was conceived many years before the deadly Paris attacks of 2015 were carried out by a Brussels-based extremist cell and the March 2016 attacks that killed 32 people in Brussels itself. It tries to build bridges in an era of distrust and fear by showing the rich civilization that Muslims first brought to Europe in the Medieval period, when they ruled in the Iberian Peninsula, today's Spain and Portugal, for eight centuries. There they produced a rich civilization and oversaw a long era in which Muslims, Jews and Christians lived in peaceful co-existence, albeit with Jews and Christians as second citizens. A visitor views an artwork titled "End of Dreams" by Danish artist Nikolaj Bendix Skyum Larsen for an exhibition "Islam, It's Also Our History" at the Espace Vanderborght in Brussels, Sept. 19, 2017. The golden era is recalled today in Islamic architectural gems — castles and mosques-turned-cathedrals — that still dot Granada, Seville and other parts of Spain, Portugal and even Sicily. Jean-Francois Ravagnan, a visitor from Liege, Belgium, said he found the exhibition a "chance to set the record straight." "We no longer take the time to look at our common history. We're no longer interested in the other, in their origins, in their traditions," he said. The show also addresses difficult issues, including violent extremism and the problems that Belgium and other Western European countries have faced in past decades in integrating large Muslim communities. While stressing that integration is often a success, the exhibition puts some blame on both native populations and Muslim migrants for the times integration fails, and says building bridges requires accommodation on both sides. To Muslim newcomers there is a pointed message delivered in a short video: certain values are "non-negotiable" in Europe, including democracy, individual rights, secularism and gender equality. A variety of traditional objects and installations are used to tell the story of three major periods of Muslim presence on Europe's soil: the Arab conquest of Spain in the Middle Ages; Ottoman rule over southeastern Europe starting in the 14th century; and the Colonial era, which opened the way for Muslims from the Middle East and Africa to begin settling in Europe in the 20th century. The unsettled problems of today, including the large-scale migration over the past few years and Islamic violence, are dealt with primarily with artistic installations, some of them provocative. One installation — "End of Dreams" by Danish artist Nikolaj Bendix Skyum Larsen — is an ode to those who have died trying to reach Europe in dangerous voyages across the Mediterranean Sea. 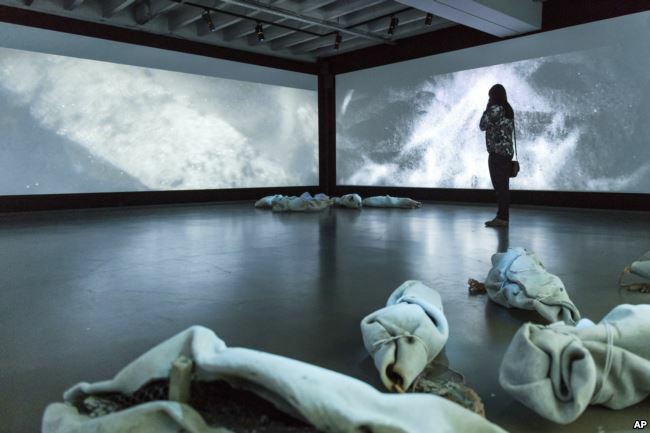 Visitors find themselves in a dark room surrounded on all four sides by large videos of the sea bottom, with bundles on the floor evoking the small bodies of children who have drowned at sea. 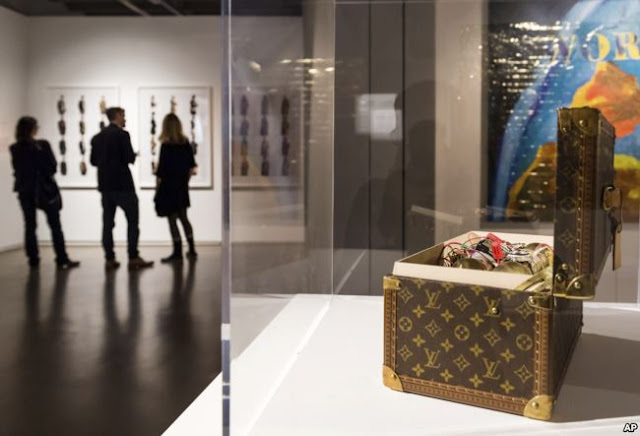 Visitors stand near an installation by U.S. artist Gregory Green in which a mock bomb is held in a Louis Vuitton vanity case for an exhibition "Islam, It's Also Our History" at the Espace Vanderborght in Brussels, Sept. 19, 2017. But one installation in particular provoked some Muslim schoolteachers from Belgium on a recent visit — a Louis Vuitton vanity case holding a mock bomb, creation of U.S. artist Gregory Green. Nejia Adouiri, a 41-year-old primary school teacher, said she found it "very confrontational" that the show "wanted to make a link between Islam and what has been happening recently worldwide." She was also upset by that it was among the last objects in the show — giving it the power to linger with visitors. In response to the criticism, organizers told The Associated Press that they intended to move the installation to a different place in the exhibition hall to give it less psychological weight, and would also probably add some textual context. But they said they wouldn't remove it entirely. Eli Barnavi, a historian from Tel Aviv University and president of the scientific committee that developed the exhibition, said that while jihadi extremism is an aberration in the long history of Islam, it's a reality of the current age that must be dealt with too. He said society must grapple even with these difficult issues, and that while organizers and city officials were hesitant to open the exhibition soon after the 2016 attacks, the time was finally right. "Slowly but surely everybody started to understand that that's the moment to do it," Barnavi said. "That precisely because of the strife and the violence and terrorism it's important to have some kind of pedagogical approach, some kind of dialogue; and the exhibition is meant to do precisely that, to show that Muslims are very much part of Europe, that they belong here, that it's a very old presence on European soil, that they had an important influence and impact on this civilization."